This entry was posted in Pilgrim Mother Apostolate on November 5, 2017 by cleja. 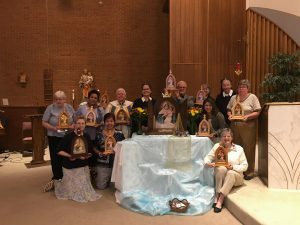 Father Joseph’s “Blessing and Sending of Schoenstatt Classroom Pilgrim Shrines” September 7 was attended by all the students at St. John Neuwmann Catholic Grade School located in Maryville, IL. 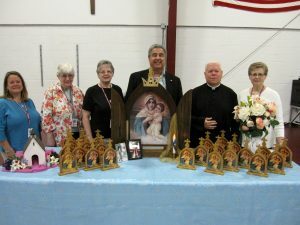 Father Joseph Havrilka is currently the pastor of Mother of Perpetual Help in Maryville and the school’s current administrator. It was a wonderful Catholic Grade School experience for the children and adults alike. Father Joseph went out of his way to make this a memorable occasion. Dear Mother Mary, I want to be like you. Help me to think of Jesus in all I say and do. Make my hands more helpful as I work and play today. Help me to see the good in all people I meet this day. Open my ears to listen to those who care for me. Let my words be loving as you would have them be. Keep my heart pure, that, united with you and Jesus, my love may grow and grow. Amen. This entry was posted in MTA Illinois Event Pictures, Pilgrim Mother Apostolate on October 15, 2017 by cleja. Opportunity to sign-up to receive the Pilgrim Mother for a year: YEAR 2 – The Promises and Requests of the Covenant of Love Refreshments, including Shrine Cookies, will be served. This entry was posted in Pilgrim Mother Apostolate on October 8, 2017 by cleja. 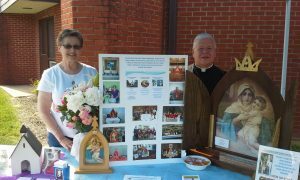 Father Joseph Havrilka, pastor of Mother of Perpetual Help Church, and Carol Mechler, Schoenstatt Pilgrim Mother coordinator and parishioner, are standing at the Schoenstatt Pilgrim Mother table during the MPH Parish Picnic on August 13. The Pilgrim Mother Shrine Apostolate table welcomed prayer requests to be sent to the Schoenstatt Fathers for a Mass in the Shrine. In addition, families signed up to receive a visit from the Pilgrim Mother. Flyers also advertised the upcoming Schoenstatt October 13 Celebration. It was a beautiful day and the Parish Picnic and Chicken Dinner were a huge success. This entry was posted in Pilgrim Mother Apostolate on September 2, 2017 by cleja. This entry was posted in Pilgrim Mother Apostolate on June 21, 2017 by cleja. Soon we will crown our images of the Pilgrim Mother and with that storm Heaven with the countless petitions we have for our Blessed Mother, but in particular, for our persecuted Christian brothers and sisters and for our country. Pronto coronaremos nuestras imagenes de la Virgen Peregrina, y con ese acto esperamos recordarle a la Stma. Virgen que proteja a nuestros hermanos cristianos que estan siendo perseguidos y nuestro pais. Attached to this email you will find a video message that you can use at the different ceremonies publically or privately. You do not need a password to view it. It will remain accessible until December. And, you will find the texts for the crowning ceremony, in case that anyone may still need them. Adjunto encontraran un mensaje en video para compartir de forma publica o privada. No amerita contraseña. Tendran acceso hasta diciembre. 3. Ceremony: if it was done in the context of Holy Mass, Benediction, or private family prayer. If there was a talk, please mention who spoke and the topic, e.g., mercy, the three graces, Mary’s queenship, or the like. 4. Did you focus the crowning on a particular intention, and did you add any other title to the Queen’s title? This entry was posted in Pilgrim Mother Apostolate, Schoenstatt Links on October 21, 2016 by cleja.